X-Cart is an e-commerce software that will allow you to design your own online store and sell products worldwide without any extensive development knowledge. It is easy to use and provides a lot of options you can use to make your website interesting for your clients as well. The application is fully responsive and your website will be displayed properly on multiple devices. The configuration of an X-Cart website feels natural and it takes little effort. With the options offered via the administrative panel and the guidance in our tutorials, you should be able to complete that in no time. X-Cart has a large community of experts that can provide assistance whenever you need such for the development of your website. There is an X-Cart documentation, community forum, help desk and more. 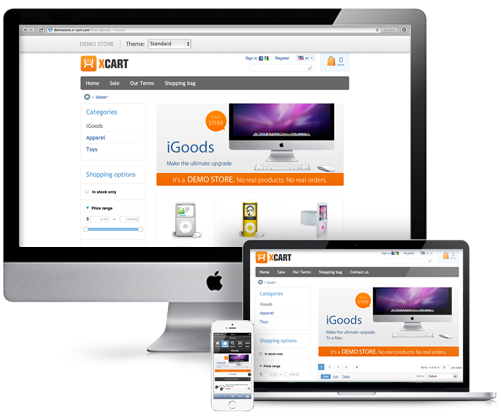 The core features of X-Cart are sufficient to start an online store. Still, if you need any additional functionality, you can always look for modules that can extend your application and provide the extra features that you need.